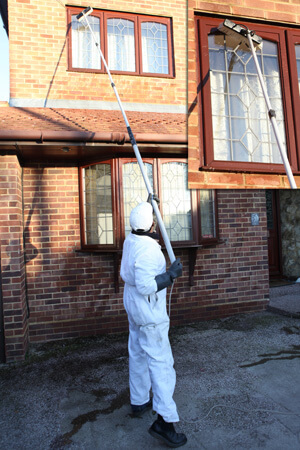 We offer a reliable, trustworthy and friendly window cleaning service in West Kent, North Surrey and South London. Our window cleaning services includes regular visits on a 4 to 8 week basis depending on your requirement. Window frames, window sills and doors are included as part of a standard window cleaning service plus window washing inside if required. Water Fed Pole Window Cleaning offers a professional window cleaning service for both residential customers and businesses alike in Kent. 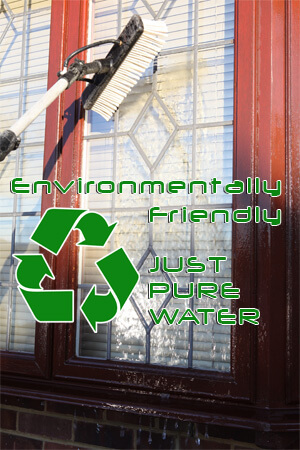 We are an eco friendly window cleaning service that is kind to the environment. The revolutionary water fed pole window cleaning system uses pure water to clean windows without using chemicals that can be harmful to the environment. Unlike door to door knocking window washers, our professional window cleaners will perform a high quality job leaving your windows dirt free and shining (they will even stay cleaner after it has rained, because we clean the frames as well as the windows). No job too big or small. We can clean windows at Domestic Houses, Commercial Premises, Hotels, Residential Care Homes, Office Buildings (up to 6 stories high), Prison Windows (CRB Checked), Schools (Enhanced CRB Checked). If you are not sure just ask us if we can clean it. Please call us on 01322 277304 TODAY (or use the Contact Form) for a price to make your windows sparkle and help look after the environment for TOMORROW! Water fed pole window cleaning is a ladderless window cleaning solution for both domestic and industrial needs. It is an environmentally friendly window cleaning solution as it uses natural filtered water and no chemicals. To keep the water as clean and fresh as possible, we empty the tanks daily and we change the water filters on a regular basis as well. Because our service is ladderless you don’t have to worry about our window cleaners walking on your roof tiles and damaging them. We supply our own water in the vehicle so you won’t have to go through the hassle of hooking us up to your water supply. 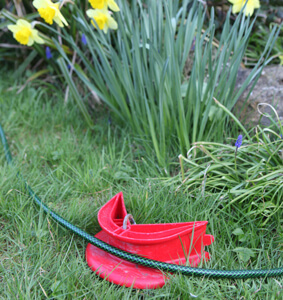 We use plastic anchors that hold the hose away from delicate flowers to prevent damage to your garden. Your Privacy is Important. Using the water fed pole window cleaning system means no-one will be looking in at the window. Even velux windows and other hard to reach places are accessible with our extendable water fed pole. Call us on 01322 277304, or fill in the Contact Form. Check us out on CheckaTrade click here. Environmentally friendly. Using natural filtered water and no chemicals. No hassle. The water’s in the vehicle already. No risk. 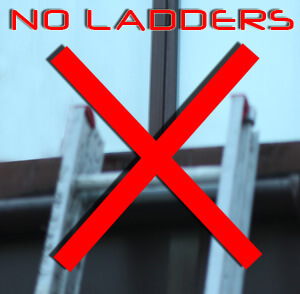 No ladders. 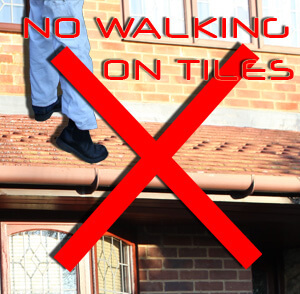 No walking on your tiles. Total privacy. No one looking in at the window. No damage to your garden. We keep our hose away from flowers. Access to difficult to reach areas. 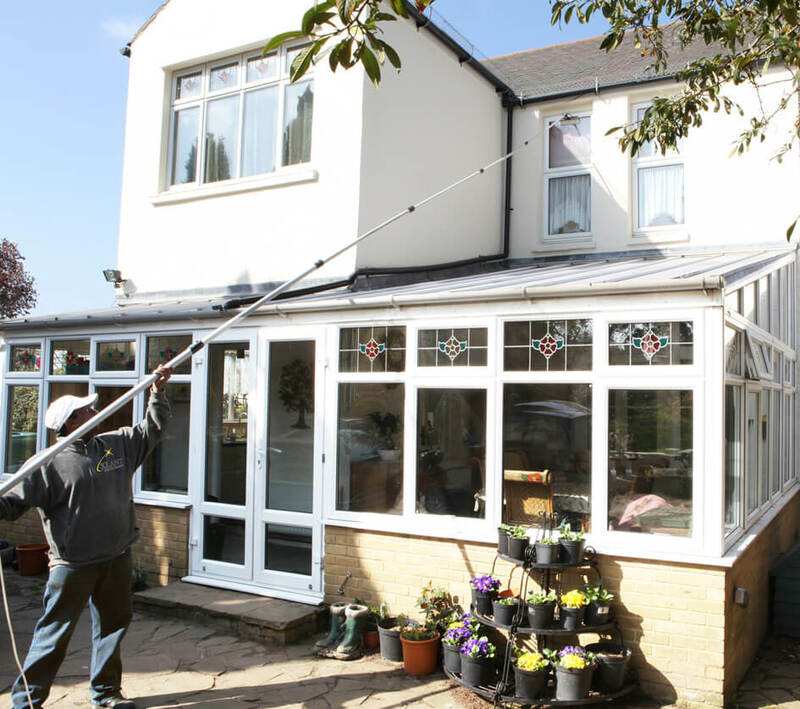 Cleaning conservatory roofs. Can reach up to a 6 storey high buildings, with the water fed pole extended. Fully equipped with our own window cleaning equipment. To save you doing the job, we offer window washing from the inside as well as window cleaning from the outside. We use professional window washing tools to get the best results from your windows giving them a sparkling finish. You can gain full benefit from having your windows washed inside as well as outside. Doing just one side is only half the job resulting in half the satisfaction. We clean windows from the inside, not just the outside. We use a squeegee to catch all of the drips. We wipe around the edges with a cloth. Completes the second half of the job that’s mostly missed out. Gain the benefit of a house with completely clean windows on both sides. 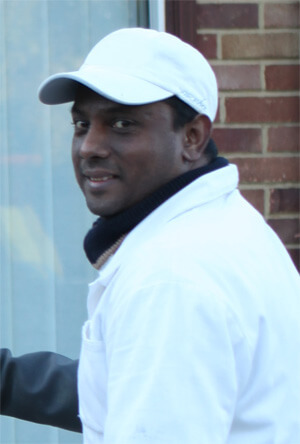 Shidan Nallan, a professional window cleaner, had been cleaning windows for several years prior to switching to a Water Fed Pole Window Cleaning System, and has been using this new system for many years. Waterfed Pole Window Cleaning UK Ltd has been created to introduce Shidan’s reputation and expertise as a professional window cleaner to a wider client base throughout Kent, Surrey Sussex and South London. In addition to serving the residential market and blocks of flats, our Window Cleaners are now serving the Hotel and Care Home Sectors.